Every transaction in EnvelopeBudget.com is associated to a bank account, therefore, before you can really do anything, you need to set up a bank account. Don’t worry, we don’t actually need to connect to you bank. You can add a bank account record for the purpose of this budget and it may have no relation to your actual bank account. It is virtual, just like the envelopes. For your convenience (and mine), EnvelopeBudget does support connecting to your bank if you choose to do so. You can connect to banks that support OFX Direct Connect. This tutorial will show you how do set up a “manual entry” bank account and a “direct connect” account. Either way, if you want to add a bank account, you will start on the bank accounts page at https://envelopebudget.com/banks/. Give your bank account a name such as “My Credit Union Checking” (or something less verbose like “Checking”). Click the Next button. Give your bank an opening balance. At this point you would want to log in to your online banking account and check the current balance and enter it here. Click the Next button. You should now be back on the Bank Accounts view where you started and you should see your bank account on the list. 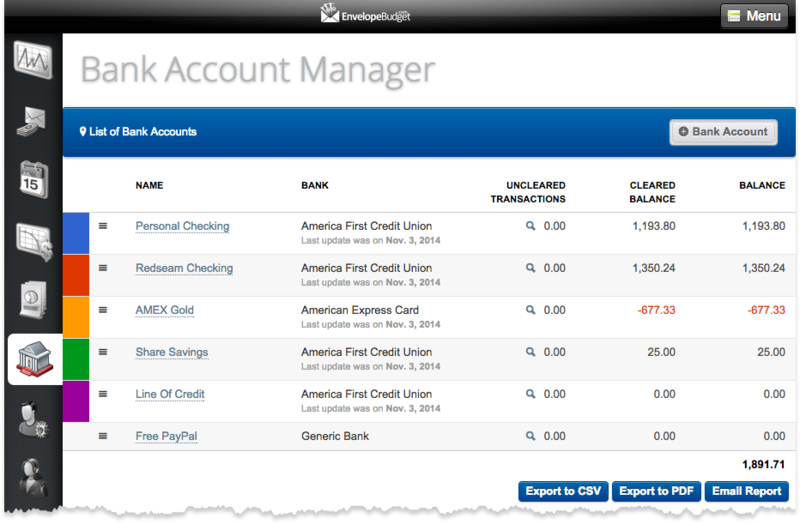 From this view you can sort the order Bank Accounts are displayed, or edit or delete the bank account. To edit or delete, hover over the bank account name. Two icons will appear that will allow you to edit or delete, respectively. Click on the + Bank Account button. Select the “OFX Direct Connect” radio button and click the Next button. Select your bank (or credit card account) from the Bank drop-down list. Enter your direct connect username or account number and pin or password. This may or may not be the same as your web access login. Some banks require you to call them and enable direct connect. Some banks charge a monthly fee to enable direct connect. Some banks just work. For example, I bank with America First Credit Union. My direct connect login information is my account number and pin, which is also my web access login. For American express cards, my direct connect login information is my username and password that I use to log in at AmericanExpress.com. After entering your login information, click the Next button. If you login credentials were successful, you should see a list of your available accounts. For example, at my credit union I have Checking, Share Savings, & Line of Credit. Above each account type there is a switch asking if you would like to import this account. For each account, turn this switch on. Also, you can optionally change the name of the bank account ad the opening balance date. All transaction will be imported back to this opening balance date. I suggest keeping it simple and starting with the default of today’s date. After selecting your accounts to import, click the Next button. You should now be back at your Bank Accounts page with a list of your bank accounts. Verify that the bank accounts you have selected are there and the opening balance appears correct. Thanks basically it for adding bank accounts. Check out our next tour topic on allocating your initial bank account balance. For more information, see the blog post All About Bank Accounts.